Juvenile Bald Eagle can be confounded with Golden Eagles. 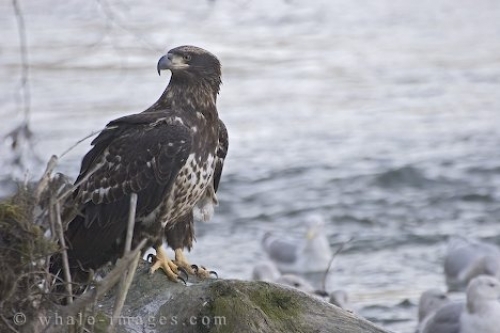 Photo of a juvenile Bald Eagle sitting beside the Squamish River near Brackendale in southern British Columbia, Canada. Juvenile Bald Eagles are easy to confound with Golden Eagles because of the brownish color. It usually takes up to three years before the juvenile Bald Eagle develops the typical white head. One of the best spots to see Bald Eagles, including juvenile Bald Eagles is Brackendale near Squamish in southern British Columbia in Canada. Here you can find more Information about watching Bald Eagles in Brackendale (Squamish) in British Columbia. Photo of a juvenile Bald Eagle sitting on a rock along the Squamish River in British Columbia, Canada.